In February we went to Washington, DC for a hot minute for a little museum hopping, eat some good Eastern European food along with a little vodka tasting. This time of year in DC is pretty magical, the winter light creates gold casts over the marble buildings and the long shadows magnify the aura of mystery in a city so steeped in history. There also aren't a lot of people that willingly brave the chilly air to walk and see the sights, so the city is nice and bare in comparison to other times of the year. Once again I got to see a few Hudson River School paintings by both Albert Bierstadt and Thomas Moran. Bierstadt was the first one we ran into at the Smithsonian American Museum of Art, titled "Among the Sierra Nevada, California" and then shortly after I found another in the National Gallery of Art called "Mount Corcoran." I'll be honest in that I'm not a huge fan of Beristadt's paintings or personality. His trees always feel a bit clunky, the paintings a touch overworked and he was never the most humble of beings (for example he renamed "Mount Corcoran" to impress the banker William Corcoran [nga.gov]), but I do have to admire his skill in creating light effects. In this case though I was less interested in his biography and more interested in the compositional parallels between the two paintings mentioned above. The similarities are indicative of how artists in that time would compile multiple studies of the same or different locations into the same composition. Bierstadt was a huge proponent of not only sketching and painting studies of his subjects, but also photographing them and more specifically using sterographs to heighten the depth of space. [Jensen] As is typical with many artists today, he would then bring these materials back to his studio and evaluate how they could be turned into paintings. Both works take place in the Sierra Nevada, which naturally gives them the same flora, fauna and geological basis. On top of this there are repeated elements that feel almost formulaic when you look at some of his other work. The sweeping curve of the lake around the right side of the composition is one of those things, it leads the viewer back to a stand of trees and up into the sheer rock faces in the distance. The animals that pepper the shoreline are also similar in placement and purpose. He also adds in excessively dramatic clouds and lighting to each of the scenes for maximum impact. I think this formulaic approach versus a legitimate study of the weather patterns, geology or realistic characteristics of that specific place is often where I get lost with the Hudson River School and particularly Bierstadt. There is such a thing as too much perfection and too much fantasy, the sickly sweetness that caused the derision of this type of work for decades couldn't help but be a biting taste in my mouth once I had the opportunity to study these works more in depth. On the other hand is one of my favorite Hudson River painters, Thomas Moran. I find Moran to be a bit more analytical and downt to earth than Bierstadt (not to say Bierstadt didn't observe the landscape, he just did it with a different, more grandiose focus). When he traveled Moran would tirelessly study the different effects of weather, geological formations the characteristics of specific places. He was less concerned with mishmashing multiple viewpoints and would often only shift the weather or lighting of a scene. Similar to Bierstadt he worked from extensive sketches and photos, but he also chose to work from memory and the feeling of the place more so than anything. This could be due in part to his influence from Turner, but I've always been fascinated by the process of intense study and ultimately the inclusion of memory into the work. Maybe this is why I've always been drawn to Moran, or it could be all of the umber and red dirt, who knows, either way anytime I see his work in person I get an inexplicably strong pull of connection to it. 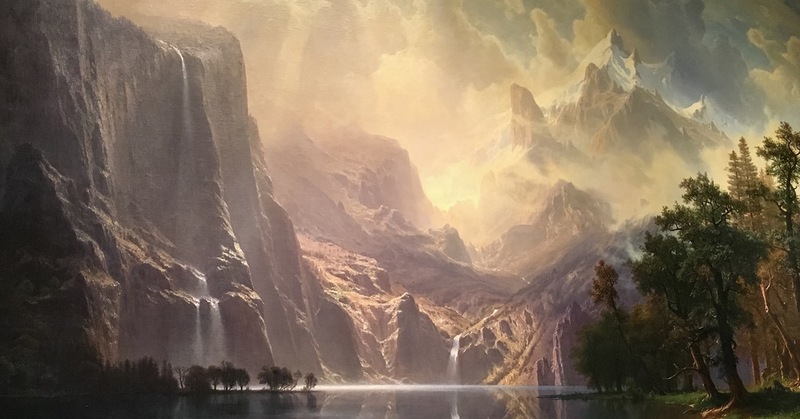 This is now the second time this has happened, the first was at Crystal Bridges back in November last year, and I spent an exceptionally long amount of time analyzing this amazing set of Thomas Moran paintings in the Smithsonian American Art Museum. Seeing these three works was by far the highlight of my trip. The last find was a small Andrew Wyeth painting of a window with a curtain billowing through that showed off his attention to detail. Again similar to the "Pentecost" work that I discussed in this post, it's a painting of a simple moment in time that has a maximum impact. MINT "Where We are Going, Where We Have Been"